Everyone knows that the first people to fly successfully in an airplane were the Wright Brothers in December 1903. But few people have ever heard of the second man to fly—Albert Santos-Dumont in 1906. Santos-Dumont was a wealthy Brazilian-born engineer who was living in Paris. At the time, France was the center of the aeronautic world, and Dumont became interested in flight and began designing and building his own dirigible balloons. During the 1890s, he flew a number of different dirigible designs and became one of the most famous men in Europe. In 1901, when the oil baron Henry Deutsch de la Meurthe offered a prize of 100,000 francs to the first person who could fly a balloon from the Paris suburb of Saint Cloud around the Eiffel Tower and back within 30 minutes, Dumont made the flight in his Model 6 dirigible. For the next few years, he made demonstration flights in his balloons all over Paris, one time flying his latest Model 14 from his home to his favorite restaurant and parking it on the street. In January 1904, word reached the Paris aeronautical community that two Americans had flown in a controlled heavier-than-air machine on a beach in North Carolina. But the Wright Brothers, fearing that someone would steal their ideas and copy their design, were secretive—few people actually saw their flights, and after Kitty Hawk they moved their experiments to a secluded field outside their hometown of Dayton OH, where they forbade the local press from photographing their machine. Many in Europe doubted the story and concluded that it was a hoax. A number of aeronauts, most of them French, continued their efforts to make the “first” airplane flight. And among them was Albert Santos-Dumont. When a prize was offered for the first heavier-than-air flight of at least 25 meters, Dumont began designing a flying machine. In almost every way, Santos-Dumont was the polar opposite of the Wright Brothers. While the Wrights were, by nature, shy and uncomfortable in the spotlight, Santos-Dumont was outgoing and loved the press. While the Wrights were intensely business-minded and jealously guarded their patent rights, Santos-Dumont freely offered all of his aeronautical research and designs for everyone’s use, considering them as a “gift to humanity”. And while the Wrights did the best they could to hide their research from the public (going so far as to schedule their flights so they couldn’t be seen from the nearby city bus route), Santos-Dumont conducted all his tests out in the open, with large curious crowds on hand. But unlike the systematic and careful research carried out by the Wright Brothers (they had even designed and built their own wind tunnel to test various wing configurations), Santos-Dumont and the other European aeronauts were literally trying to fly by the seat of their pants, with all sorts of bizarre contraptions that were basically designed from scratch. Santos-Dumont based his flying machine on a configuration that had been built by Frenchman Gabriel Voisin, which used a boxlike frame of wood and canvas. Although it looked clumsy and unwieldy, it was very stable, and Voisin’s machine, towed behind a fast-moving boat on the Seine River, proved itself able to become airborne for a few seconds at a time. Dumont named his design the “14-bis”, after his Model 14 dirigible. (“Bis” is an engineering term meaning “second version”.) Taking the pilot’s nacelle from the Model 14, he added large box-kite style wings, inspired by Voisin, and added a smaller box-shaped “canard” at the front which could move both up and down and from side to side, to act as an elevator and rudder to give rudimentary steering. The wings were canted up at a ten-degree angle to give lateral stability. The plane was powered by an 8-cylinder 24-horsepower Antionette engine. The pilot flew standing up, and used control cables to manipulate the canard during flight. But because the Europeans had not done the systematic research that the Wrights had (and the Wrights had not released any of their data or designs), the 14-bis was exceedingly primitive. Unlike the very efficient airfoil propeller used by the Wrights, Dumont’s plane had paddle-shaped cloth-covered blades that generated little thrust. None of the European designs had anything like the “wing-warping” system used on the Wright Flyers, so there was no effective method for turning the aircraft in flight other than the crude canard at the front. One advantage the French did have was better engines—in 1903 the Wrights had no small light gasoline engines available and had to build their own. At first, Santos-Dumont tried to test the plane’s aerodynamics by suspending it from ropes beneath one of his dirigibles, but this proved to be too dangerous and was abandoned. So he began a series of ground tests in August 1906—and found that his engine was not powerful enough to get him off the ground. So he replaced it with a larger 50-horsepower version, and also modified his propeller, replacing the cloth blades with aluminum. 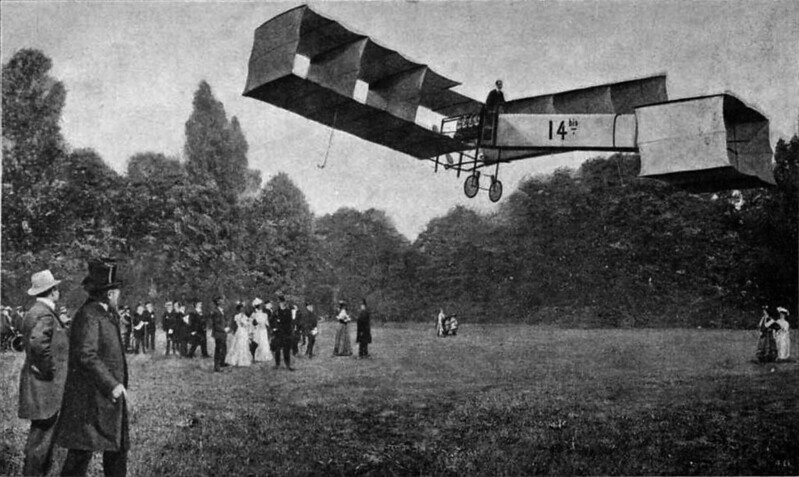 The 14-bis was ready for its first test flight on September 13, 1906, at a field in Chateau de Bagatelle. In their first flights, the Wrights had used a metal-topped wooden railing as a takeoff platform, since they could not get a takeoff run in the soft sand at Kitty Hawk. Succeeding models of Wright Flyer used a weighted catapult system to quickly pull the aeroplane to takeoff speeds, eliminating the need for a long takeoff run. But Santos-Dumont and the other Europeans, with their better engines, were able to reach takeoff speeds unaided, over rough ground—though it usually took quite a distance. So as the 14-bis rolled along, it took some 300 feet to gain enough speed for liftoff, and the aeroplane rose a foot or so off the ground, for barely a second. It had “flown” for a mere hop, a distance of 25 feet. Upon settling back to the ground, the wheeled undercarriage collapsed, and Santos-Dumont skidded to a halt. On October 23, he was ready to try again, and a large crowd of Parisians turned out at Bagatelle to watch. This time, as the crowd gaped in amazement, the 14-bis sailed along about four feet off the ground, covering a distance of about 250 feet in seven seconds. Santos-Dumont had won the Archdeacon Prize, and had made what everyone in Europe believed was the first powered airplane flight. Immediately, Dumont began making improvements. He fitted small control panels known as “ailerons” (a new idea at the time) between the wing planes to make an effort at turning control. In his second flight, on November 12, the 14-bis flew for 22 seconds at a height of about 5 meters, covering 700 feet in a straight line. It was cheered in the press as a remarkable achievement. Few in Europe, however, were aware that by this time the Wrights, at their field in Ohio, were already making flights lasting for almost an hour, at altitudes of several hundred feet and with full turning control in all three dimensions. Santos-Dumont went on to design and build a small monoplane called the Demoiselle, which was widely copied by others. In 1910, he stopped flying and moved back to his native Brazil, where he was stricken with multiple sclerosis several years later. In a fit of depression, he committed suicide in 1932. If memory serves, the Wright brothers, after pioneering flight, also almost put an end to it by suing anyone and everyone else who dared do anything that vaguely resembled what they had done. Yes. They eventually won, but because they spent all their time on lawsuits, their designs became obsolete, and they were bought out anyway.